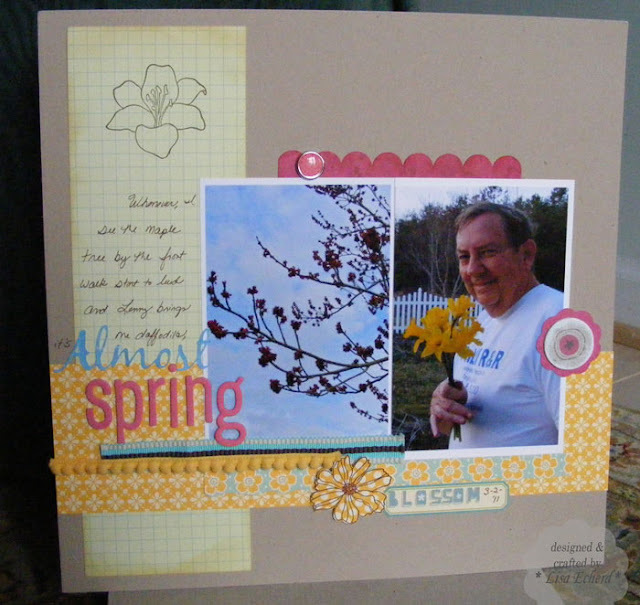 Just could not resist doing the color challenge at Splitcoaststampers this week! All blues and greens, my favorites! The dessert option was birds and I used this week's sketch challenge as well. 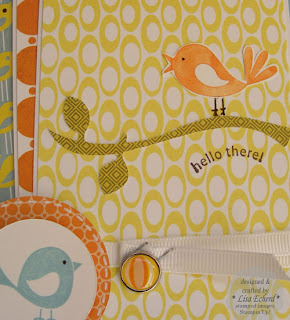 This pretty, and rather old, designer paper was already in two of the colors: Baja Breeze and Certainly Celery. 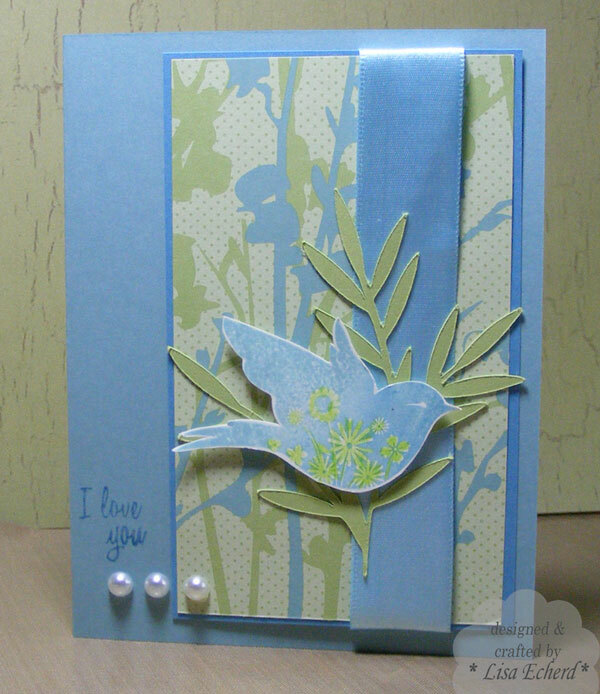 I stamped the bird with two shades of blue - Baja and Colorbox's Prussian Blue which is a slightly darker shade than Marina Mist. Then I colored in the flowers with a green pencil. 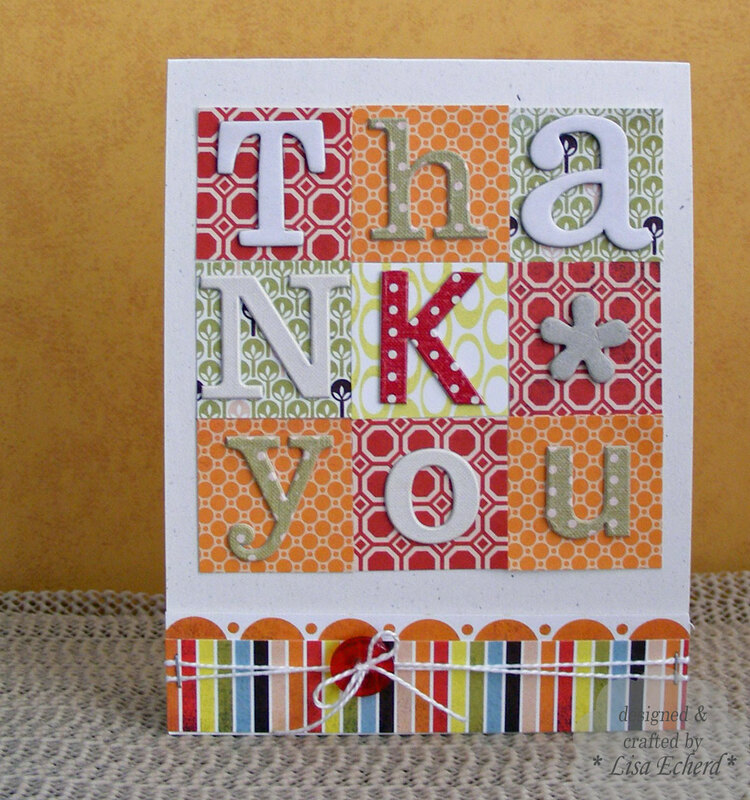 Thanks for visiting today and be sure to check out all the pretty cards in this color scheme at: Splitcoast gallery. But you would really like them to look like this? Here is how to create a panoramic photo in Photoshop Elements. The instructions are for version 9; however I was previously using version 5 and it is similar. 1. 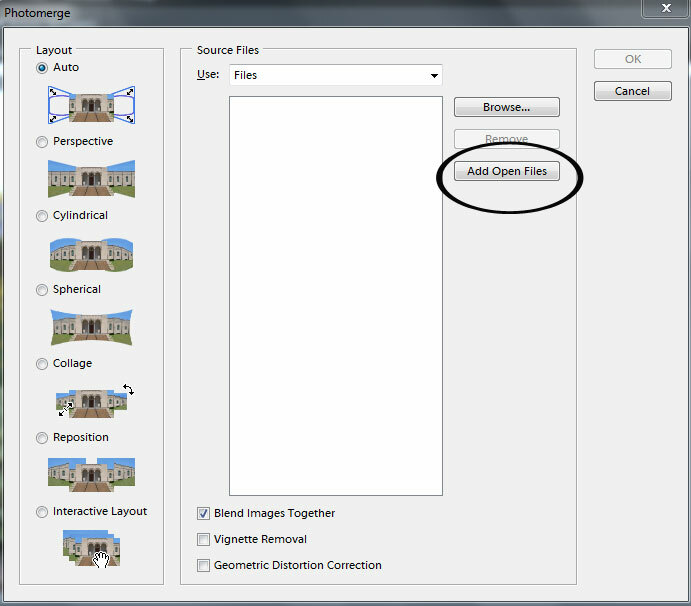 Open files you want to join together in Photoshop Elements Editor. Click on Add Open Files. 5. The last prompt will ask you to fill in the open edges. I usually choose No. You can experiment and see if PSE creates something you want around the edges. 6. Then crop as desired. There is a layout coming along with this photo. I'm just not quite finished yet. Getting Moving on Spring Cleaning - a little. At the beginning of the year I told you about my New Year’s resolution. It was to Get Moving. Also, just before the end of the year I signed up for Shimelle’s class called Blogging For Scrapbookers. Shimelle’s classes can be taken at any time and I was doing this several months maybe a year after the original class had run. I got through about half of the class before the holidays seemed to swallow my time. 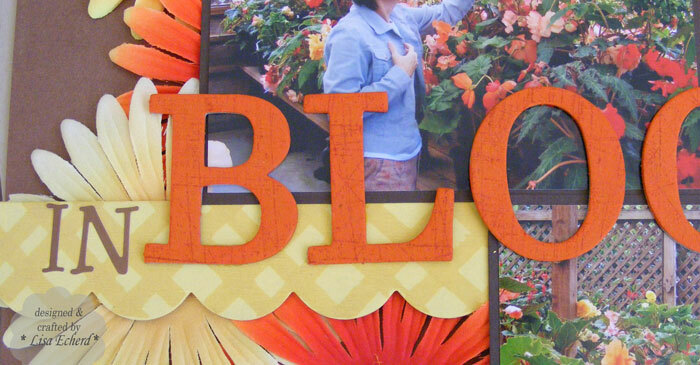 Fortunately, she is offering a follow-up class and as a precedent is rerunning Blogging for Scrapbookers. We’re receiving the prompts each day so I can do things that I missed before or in this case give you an update. This is day six of the class and the topic was sharing a goal. I thought it would be a good time to update on the goal I shared in January. So what is Get Moving? My resolution was to do something every day to get me off the couch and out from the computer. It was to increase my activity level and eventually improve my overall health. I’m really lousy at exercise goals so I thought making this just to do something without having to say do so many sit-ups, or walk X amount of miles, or join a gym would be a lot easier and much more likely to succeed. And I might get weeds pulled and my house cleaner in the process, what a deal! One of the other things I told myself was that I would not let aches and pains interfere with my commitment. If my knees hurt and I couldn’t walk, I would do something else. I have made some progress. I’ve kept a log and I actually recorded quite a lot of activities February. I did OK in January and was pleased to see that I was improving as the year when along. Then came March; and my commitment wavered greatly. Now I will say that I’ve done quite a bit of walking in March as the weather has got warmer. The recurring issue are those darned aches and pains. I have an underlying health condition that I’ve had since I was a teenager that always interferes with my activity level. And of course is I get older and picking up more pesky little problems which are sometimes short term and often become minor chronic issues. 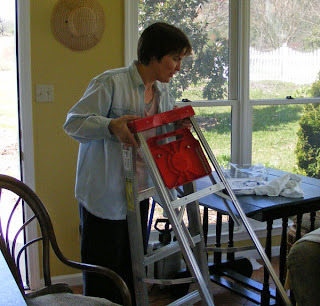 Several weeks ago the shoulder pain that I was experiencing last summer came back. The wasn’t as bad as before but it was certainly more persistent. In fact right now I am using Windows speech recognition software to dictate to my computer rather than type. So the gist of all this is that I have lots of excuses and I’m working hard to overcome or work around them. I’m getting some help with my physical problems. I still have a goal of being stronger and ultimately developing less new aches and pains. Another thing about my resolution is simply reminding myself. I made a scrapbook page and posted it where I would see it every day but apparently that isn’t enough. Inspiration Page Last night when I peeked ahead to see what today’s prompt would be the reminded me of my resolution. I had a few extra minutes so I did some extra housework and really got myself moving and got cleaner floors, too. Maybe I need to stick post-it notes all over the house! There’s still plenty of things I can do it’s a matter of constant commitment. I was watching 60 Minutes last night - after my cleaning spurt. Andy Rooney was going on about things everyone tells you are good for you that often contradict one another. He said he was waiting for the study that tells you ice cream is good for you. Me, too! That would be one healthy commitment I wouldn't need to be reminded of. There weren't many leaves on the trees the day we took this first hike of the year. We didn't care we just loved being outside one day in February. 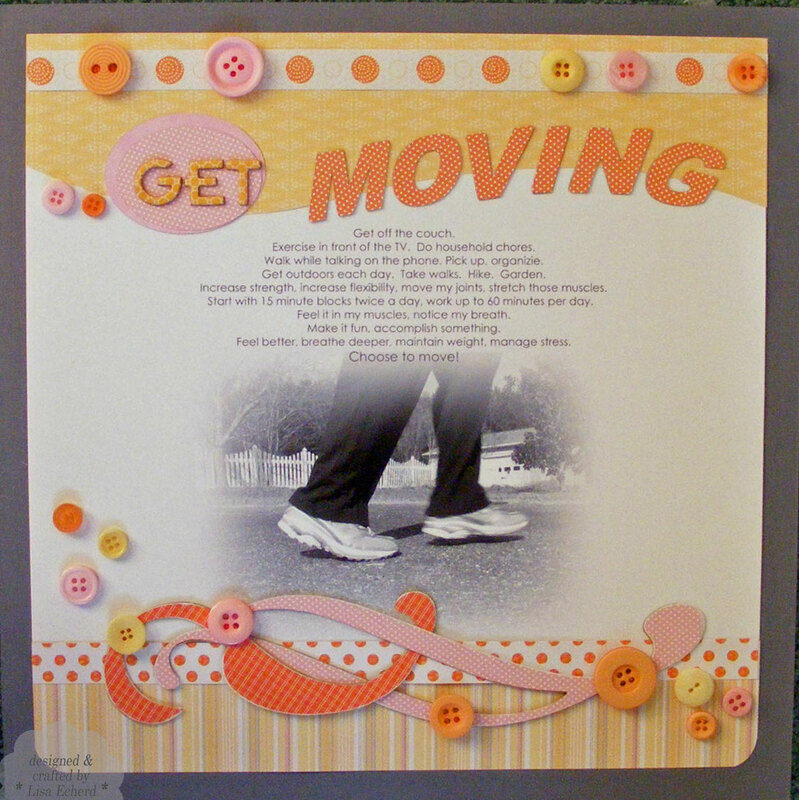 I used lessons from Nichol Migourk's classes at 2P's to make this layout particularly the March scrapbook stamping class focused on using rubber stamps. 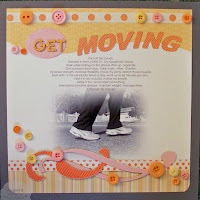 For the border, I used a rubber wheel which I've mounted as a cling stamp. I inked the image with various shades of browns for a semi-distressed look. 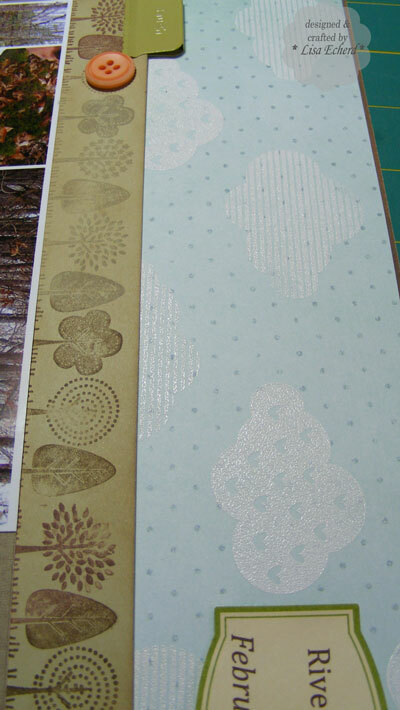 The clouds are stamped with acrylic stamps from Hampton Arts because I didn't have an cloud paper that matched. 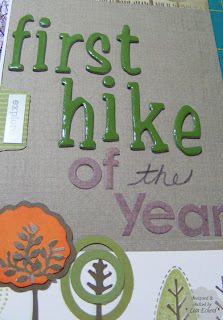 I embossed them in white embossing powder. 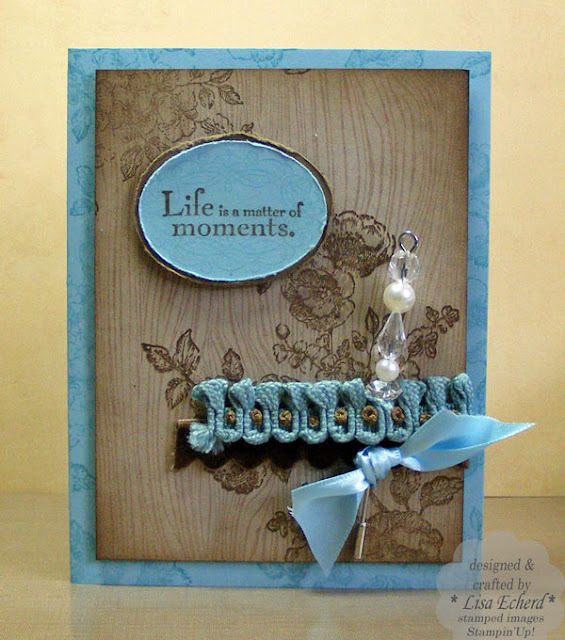 This border meets the challenge by using traditional wood mounted rubber stamps. In February, lots of trees are bare so I just stamped some trunks as well as some with a little greenery. The border is also filled in with Cricut images from Straight from the Nest. This was a really fun page to put together. I've had it on my table all week adding papers and embellishments to the pile as I thought of something. Thanks, Nichol, for the inspiration. I'm really enjoying all the monthly classes at Two Peas in a Bucket. 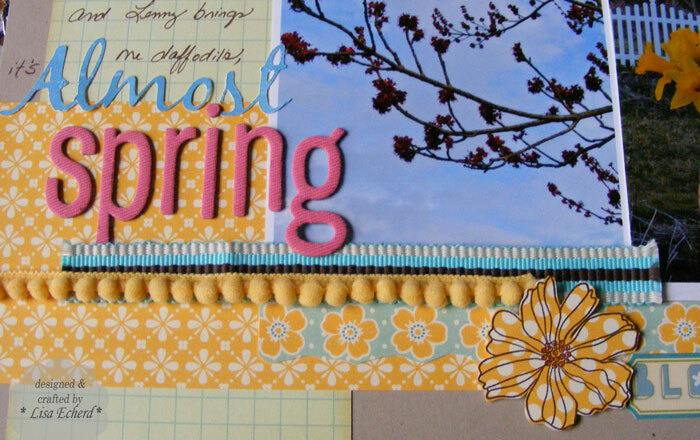 Check out their classes and events page here They have some special card making stuff coming up in April. This week I've been adding to the card stash with a lot of birthday cards. 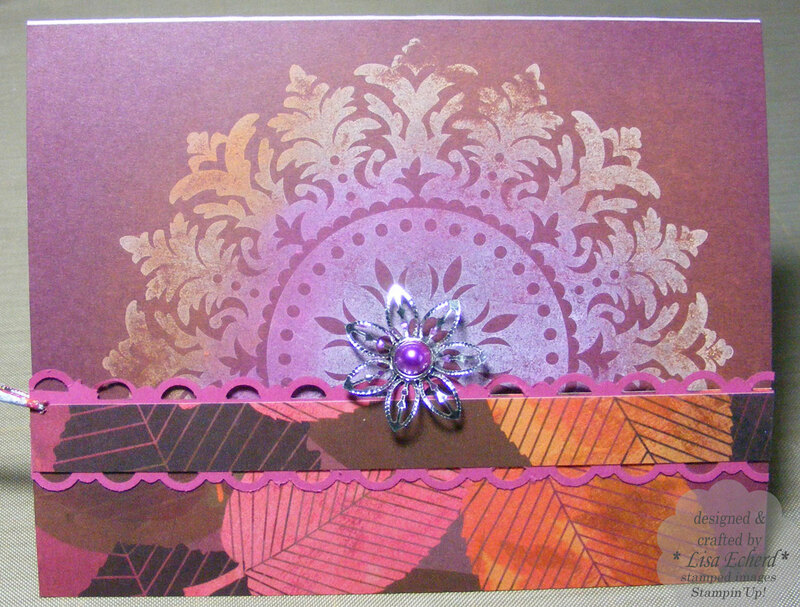 For this card I used techniques from Jennifer McGuire's stamping class last year at 2P's. The floral image is stamped with white metallic paint. Then I went over the image with various Ranger Distress inks. I couldn't remember which kind of paper worked the best. 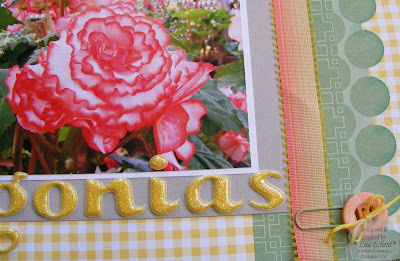 I tried both photo paper and Stamping Up's Whisper White. In the end I think I like the SU! paper the best. Thanks for visiting. I hope you will come back. 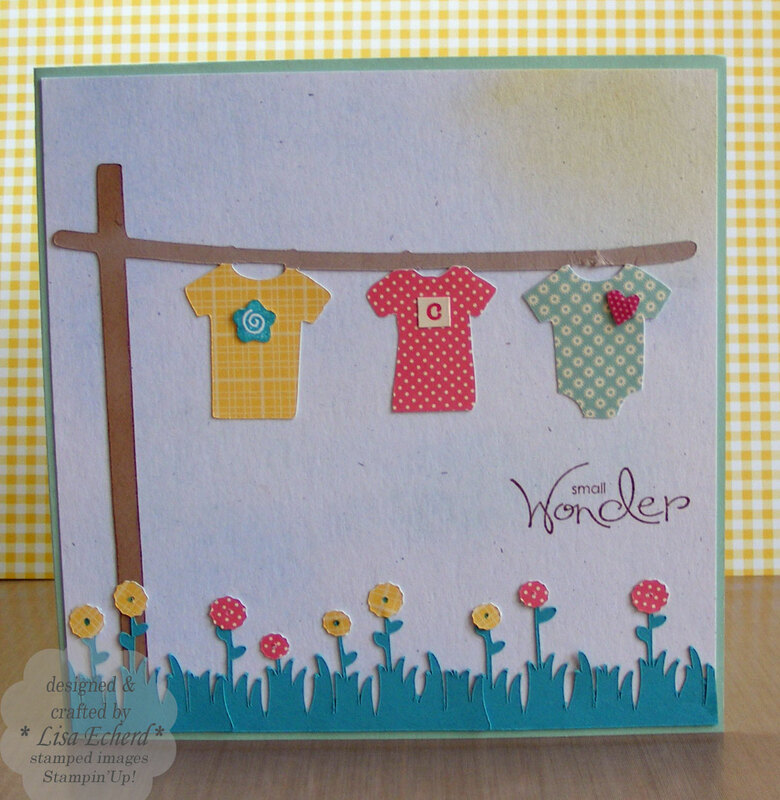 Ingredients: stamps: Kind and Caring Thoughts by Stampin Up! Ink: peeled paint, tumbled glass, tattered rose by Ranger. For both of these cards, a white or ivory background for the sentiment would have been a little stark against the pattern paper. So I softened the look by stamping a very pale image in the background. 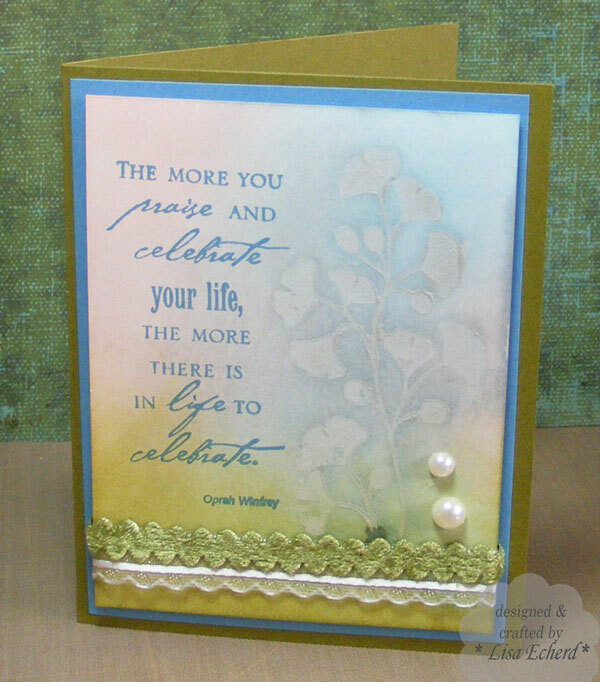 The video below shows the sentiment for the top card which starts with a simple white rectangle that gets punched, distressed and stamped for a more custom look. 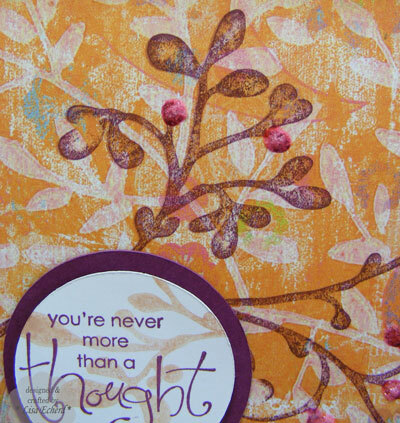 Stamps: Kind and Caring Thoughts by Stampin’ Up! Ink: Pink Pirouette, Rich Razzleberry by SU! It may be spring of 2011 but I've been reliving Christmas of 1980 Something with this old Polaroid of me at my former workplace. Although I worked for the same company for 14 years I have only three photos in my possession taken in the office. I believe this one was given to me by a friend of my husband’s when she was moving and going through some of her stuff. I’m grateful to have it as it is brought back a lot of fond memories. Over the last few days I’ve been trying to figure out when this photo was taken. I used as many clues as I could get from the background and narrowed it down to either 1988 or 1989. I let the journaling capture my thought process and as a result touched on a lot of what my life was like at that time. If only I could get a good look at the requisite Siecor Quality charts on the wall, I would probably be able to date this photo at least to the year. I can still come fairly close. I'm wearing my favorite aqua green cotton cable sweater from The Limited (I had one in peach, too) – probably bought on layaway with me paying a little each Friday night. Since the gift I’m opening is wrapped in red, let’s assume it is Christmas. My desk is remarkably clean and orderly most likely due to a rare office cleaning spell. I have a training manual or perhaps some training materials I was creating on my desk. Based on the lights above the cubicle and the furniture I would say this is the office I moved into when I went to work for Norma in the main area of the IS department. The chair doesn't help the dating process because I moved that burgundy chair from Budgeting to every office I had in IS to Training. I suppose it was with me nearly the entire 14 years. The linen Windsor wall hanging would've been a gift from some of our English friends. And finally the most telling part of the eighties is my very curly hair thanks to Connie’s perms about every five months. I know I did not have those curls on Christmas 1990 so it must be a year or two earlier. It was rare for anyone to catch me in that cubicle as I was always on the go all over the building helping people with their computer problems or conducting a class. You also can’t see my next door cubby neighbor in the photo. The one thing the same – he and I still share the same space – and I still have the neater desk – though not by much. So amidst spring chores around our house Saturday, I got to put the finishing touches on this layout for the Counterfeit Kit challenge link to website. This was my knock off of the Studio Calico Kit at right. I used all of the papers from my counterfeit kit and one of the Thickers. For the other chipboard letters I used some Basic Grey unfinished chipboard, painted it, and coated with Glossy Accents. I often mix my limited collection of paints to get a color that matches. This is similar to some new American Crafts Thickers that were in the original kit. The kit had some crochet flowers and I crocheted my own. The October Afternoon doily paper and a crocheted flower remind me of one of my favorite hobbies at that time which was –surprise! -crocheting. The kit also had some wood grain paper. 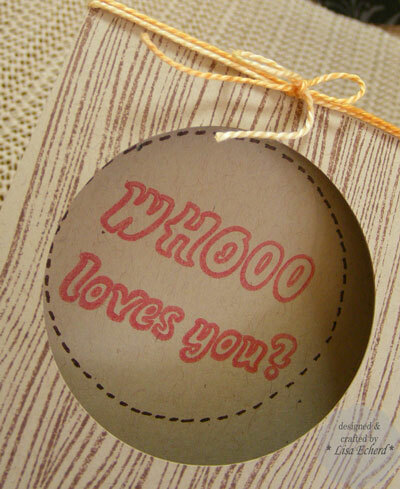 I used my wood grain stamp on card stock for the Cricut cut letters. This was a really fun exercise as I really do like to shop my stash. I did find it a challenge though to work within the items that I had selected to match the kit. I think the only thing I cheated on was the vintage brad in the middle of the flower. And yes, I used the original Polaroid even though that is a definite no-no in scrapbooking. I've scanned it into my computer and it will go in my next backup. I just couldn't resist the real thing. Besides my skin looked so good in that slightly faded photo! Allow me my rose colored memories. Thanks for visiting today! I hope you will join me for TIPsy Tuesday tomorrow. I'm planning a video tip. 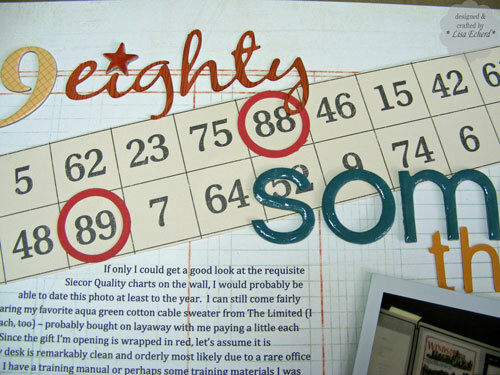 Brad: Vintage Brads by Stampin' Up! This card was such a drama queen! Honestly, I nearly called off card class because I got so frustrated getting this to come out like I wanted it, too. Ironically, it is darn close to how I envisioned. The papers, stamps and I just went round the world and back to get to this place. The medallion gets its color from the method similar to "Black Magic" which Splitcoaststampers did a tutorial on last month. Rather than coloring with markers, I used pastels. 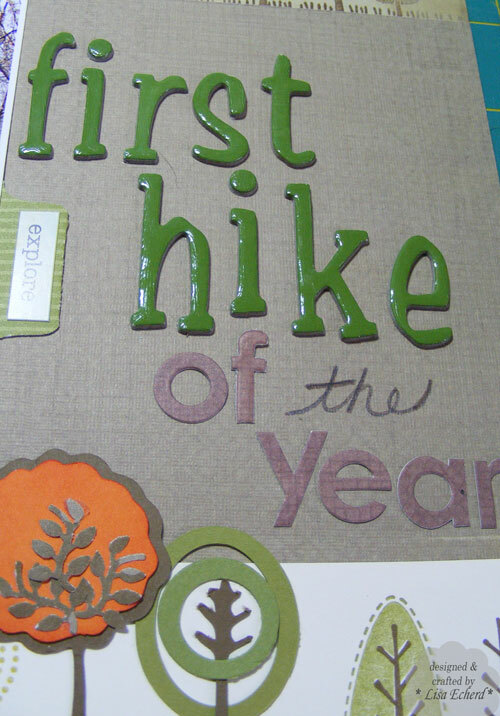 First, stamp an image in white craft (pigment) ink on a dark background and then heat set but not emboss. I then went over parts of it with two colors of pastels. Just a little goes a long way. To get color from the pattern paper without the pattern being overwhelming, I layered two pieces of the same paper with a little punched border in between. 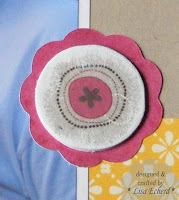 This is a tri-fold card with the flower grommet holding the fold together. It was really quite simple once I tried on lots of colors and arrangements. Thanks for visiting today. Hope you have a wonderful 'season change' weekend wherever you are. 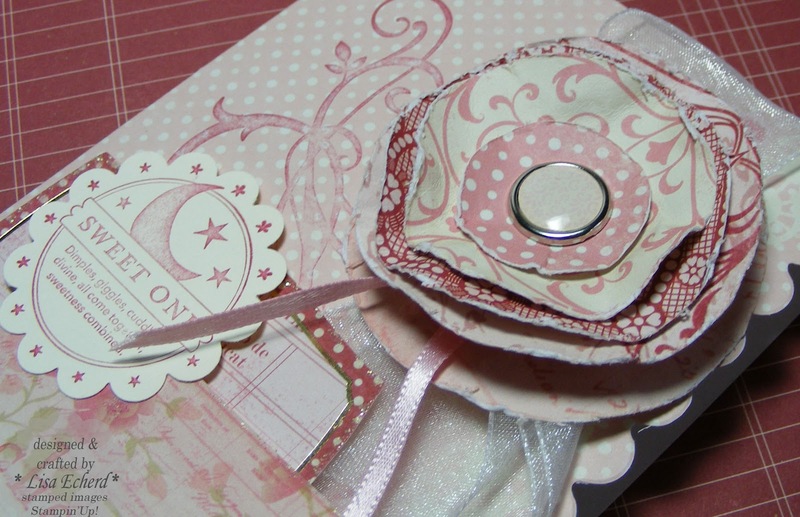 Ingredients: Stamps: Medallion by Stampin' Up! You know, I've never really used kits very much. The closest I've come are Stampin Up! 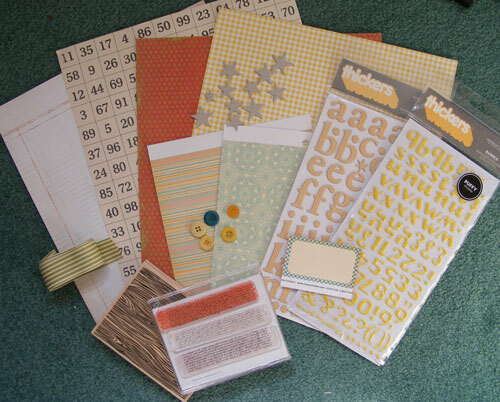 's Simply Scrappin' and Basic Grey's Collection packs which are just designer papers and coordinating stickers. Even then, I almost always pulled other things from my stash. Yet I was intrigued by the Counterfeit Kit Challenge at Counterfeitkitchallenge.blogspot.com. They have some great tutorials. This month I decided to play along with their challenge. 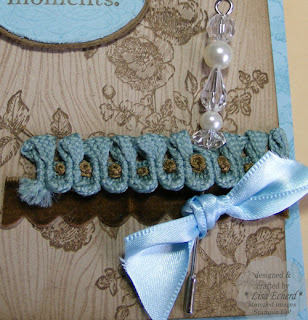 They provide a link to a current kit - this month it is Studio Calico - and you try to replicate the kit from your stash. You can also use the kit for color inspiration or make things similar to items in the kit you don't have. I know I'll be dong the little button paperclips since I've got gobs of both, just not together. It was fun going through my drawers looking for items to match what was in the kit. 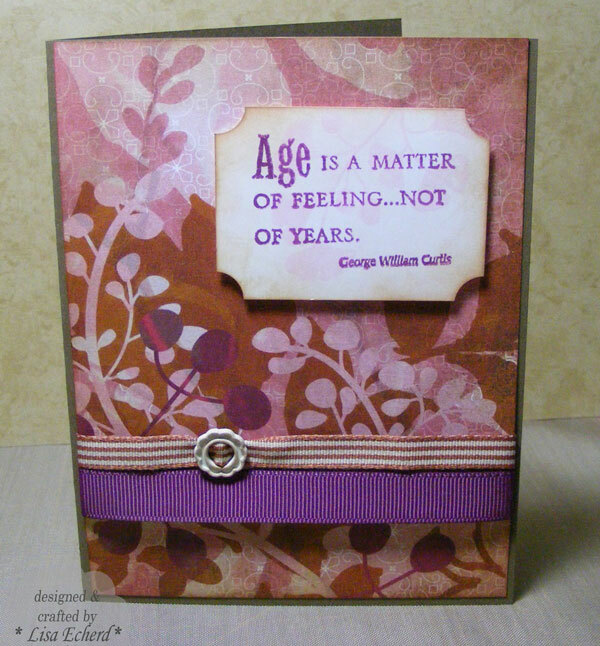 The woodgrain and text stamps above are not in the on-line kit. I included them as a reminder that there were papers with these patterns and I might try to make something similar. It was also funny that some of the papers in the kit are already on my wish list at Two Peas! I've already lifted a couple of these supplies for a page I did last weekend and I've got a page started using these supplies predominately. Hopefully, I can share it in a day or two. Right now I'm having some maintenance work done on my house that affects my scraproom so I'll have to save my creative energy for something else today. Do you like kits? Which companies are you fond of? Thanks for visiting! 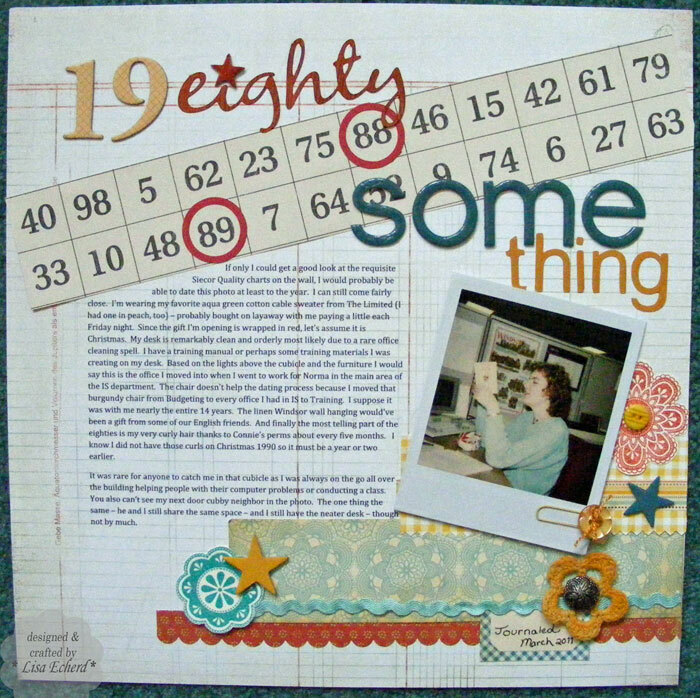 To meet both the color challenge of Baja (which I can never resist), Soft Suede and Crumb Cake and the sketch challenge at Splitcoaststampers, I have this card using some stamps on the top of my baskets. We used these same ones in card class this week. I'm not sure about this blue bow yet. The woodgrain background is done in Versamark to keep it really light. 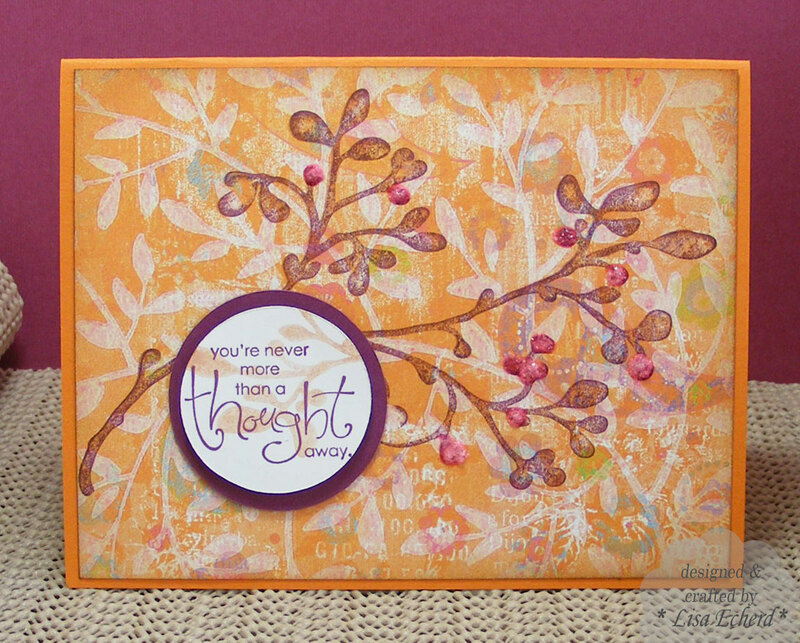 The Baja stamped image is stamped off to give it a very light background for the message. Ingredients: Stamps: Woodgrain by Hero Arts;Elements of Style and Vintage Labels by Stampin' Up! 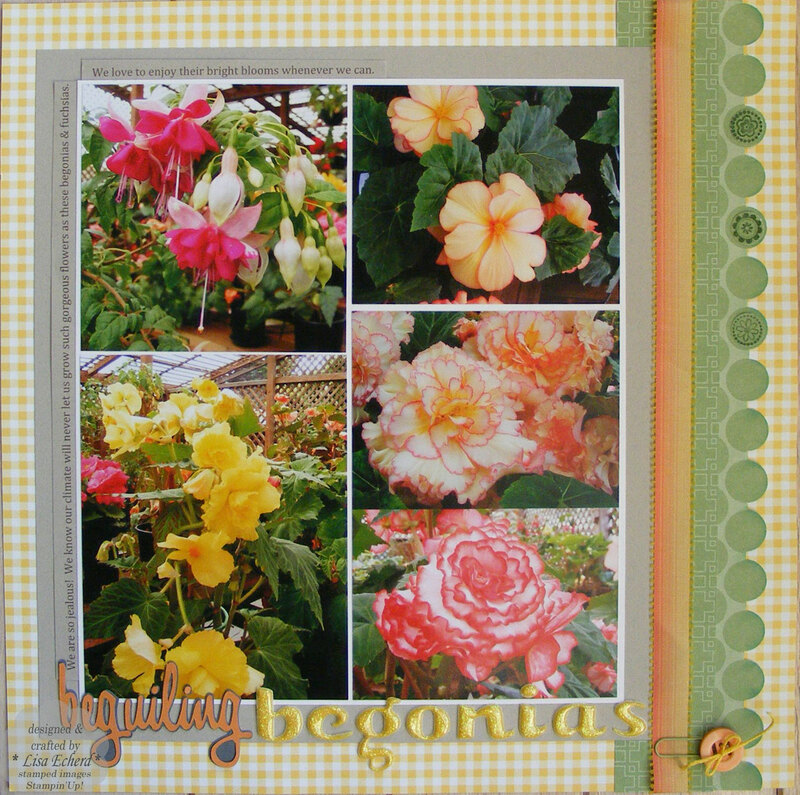 To compliment my bold "In Bloom" page a couple of days ago, I made this page with the remaining begonia and fushia photos from our garden visit in California last September. It is based on the sketch at www.artfuldelight.blogspot.com. Check out the other entries for the March Sketch Challenge at Artfuldelight's blog. The sketch is really versatile. You still have a few days to get in an entry for a chance to win her April kit. 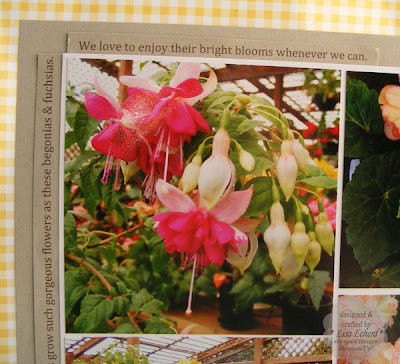 The gorgeous flowers in these photos were grown at the Mendocino Coast Botanical Gardens in Fort Bragg, California. We loved seeing them! Unfortunately, NC does not have the climate for such beauties so we take advantage of gardens wherever we travel. 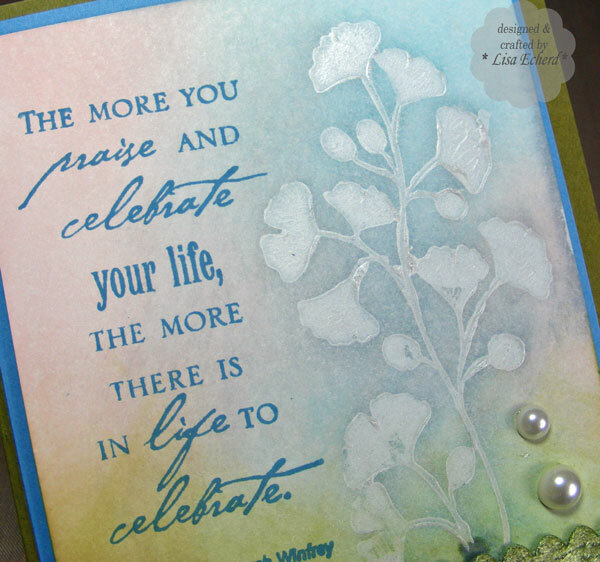 Today's tip: Print your journaling on matching cardstock to make a last minute addition. 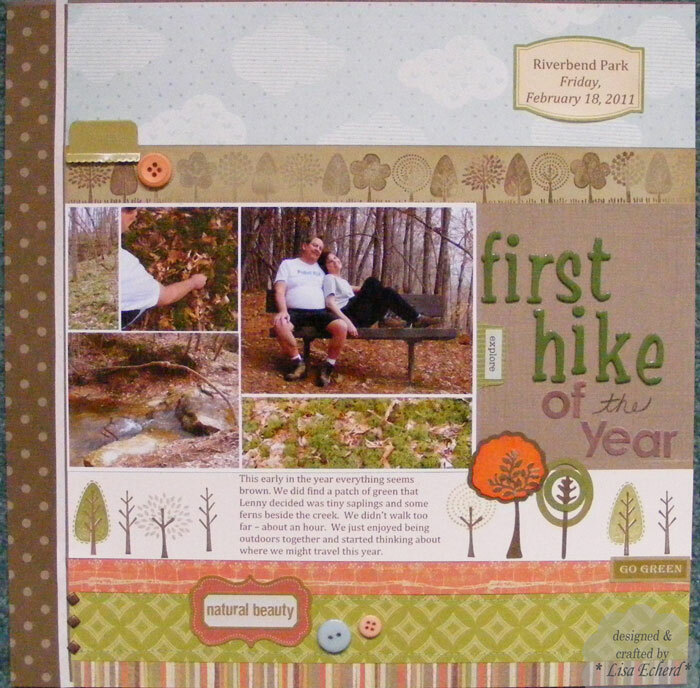 Originally, I'd planned to add a journaling block in a contrasting paper on the right side of this layout. However, the frame around my photos seemed like a better place AFTER I got everything glued down. So used a little leftover kraft paper and printed my journaling. I trimmed and glued these strips in place so they are hardly noticeable as an after thought. ALSO, check out Shimelle's blog post Class giveway for a chance to win a whole weekend of on-line scrapbook training! Sounds like a wonderful experience. 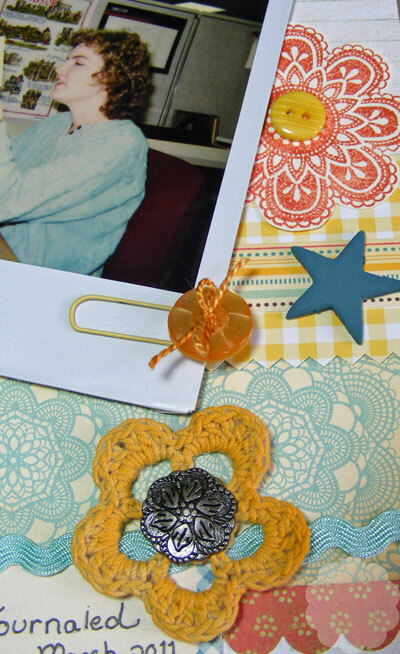 I used to do Scrapbook, etc. 's Scrap-a-Faire and this sounds similar so I'm definitely going to check it out. Ingredients: Stamps: Little Flowers from SU! 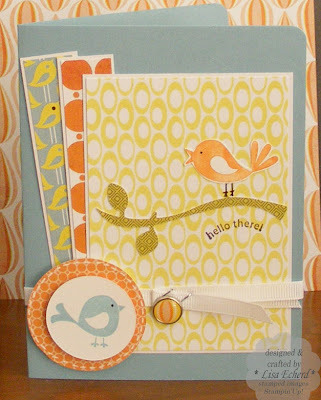 DSP: yellow check by Paper Studio; greens are Jersey Shore by SU! 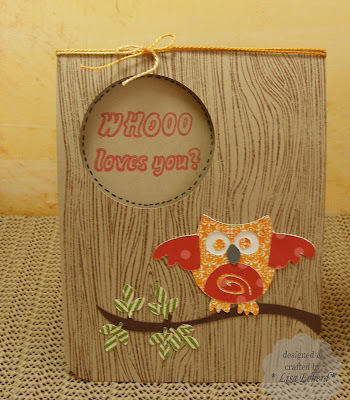 For our card class this week, we are combining an owl image from the Cricut with this saying from a Hampton Arts Valentine's set for a cute birthday card. 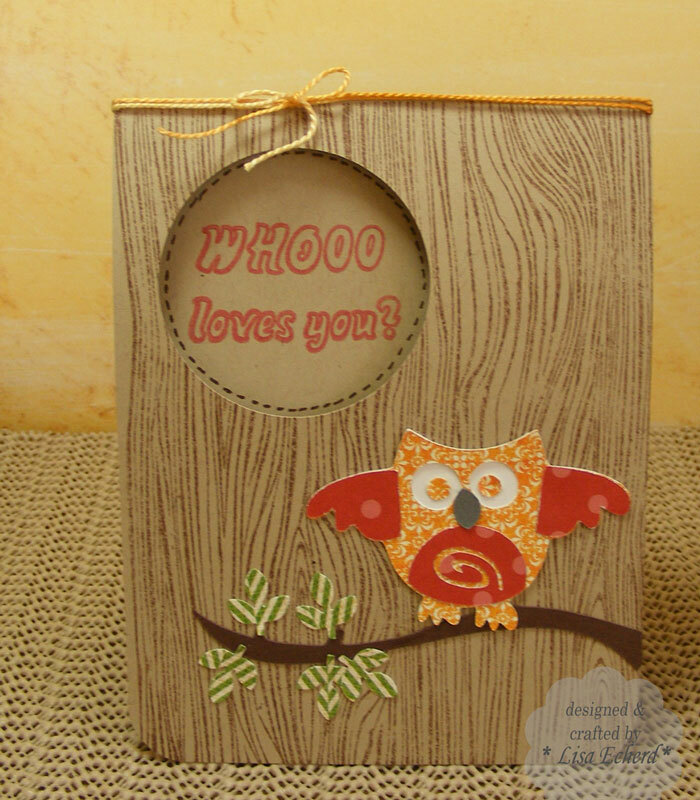 With our focus on large stamps, we are using the Hero Arts woodgrain for a background so it looks like the owl is sitting on a branch in front of a tree. 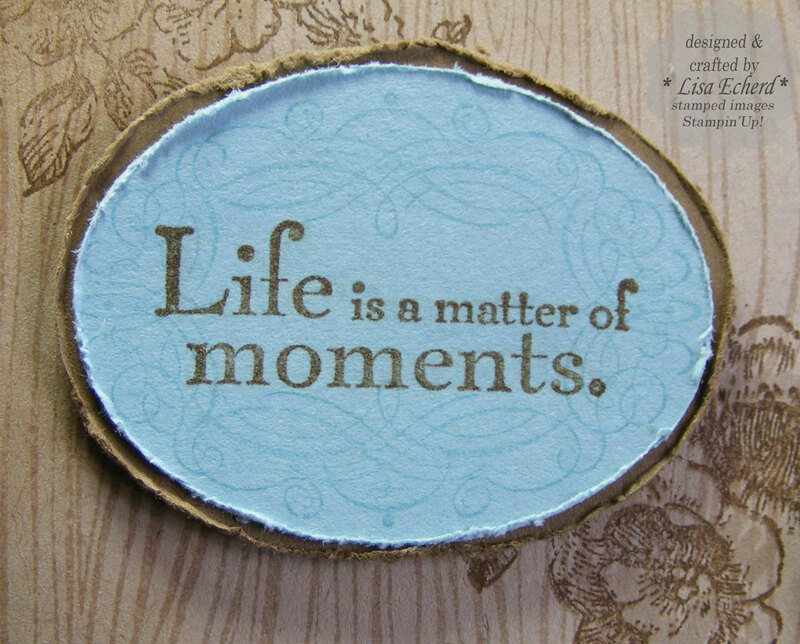 Thanks for visiting this week and hope you have a great week! Wild, isn't it? One of great things about papercrafting is the chance to try on a completely different style. If you buy an item of clothing that isn't quite your style, you might love it or not. If not, it sits in your closet taking up space and radiating guilt. I love the color yellow but I can't wear it with my skin tone. I don't even have that much of it in my home. It has to be an accent for me. And orange, forget it. For years, I said it was my least favorite color. However, I've come to really enjoy orange on my scrapbook pages and my cards. I don't want to live with it all the time, yet I can indulge in something totally different on my pages. I also worked through the stash with this ancient piece of brown MME paper for the background and some old chipboard I painted and stamped to replicated the look of the lattice in the background of these photos. Speaking of the photos... they are from the Mendocino Coast Botanical Gardens in Fort Bragg, California. This will be the intro page to several pages on these gorgeous gardens. Thanks for braving the flower patch today! Remember when mulberry paper was so popular? I must have stocked one sheet in every color! I just came across an extra stash. The smooth side made an interesting stamping surface for this detailed floral stamp from Stampin' Up! 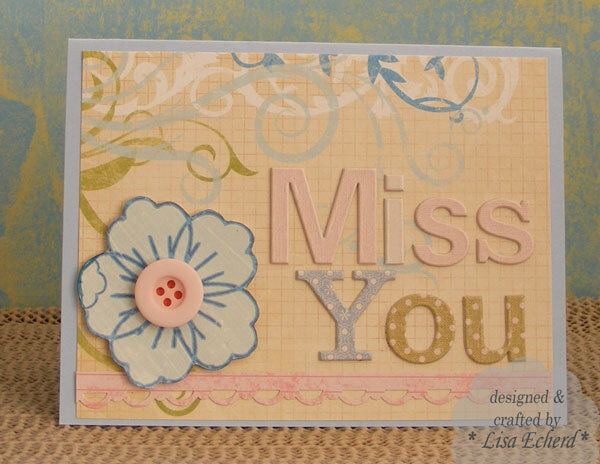 This is a really quick card for my next card class. We are concentrating on using large stamps. We are also using some K&Company chipboard out of my stash for this card. Have you rediscovered an "oldie but goodie" from your stash lately? 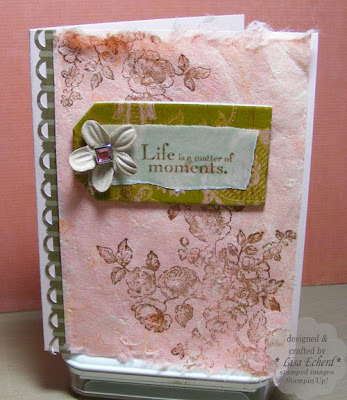 Ingredients: Stamps: Elements of Style by SU! 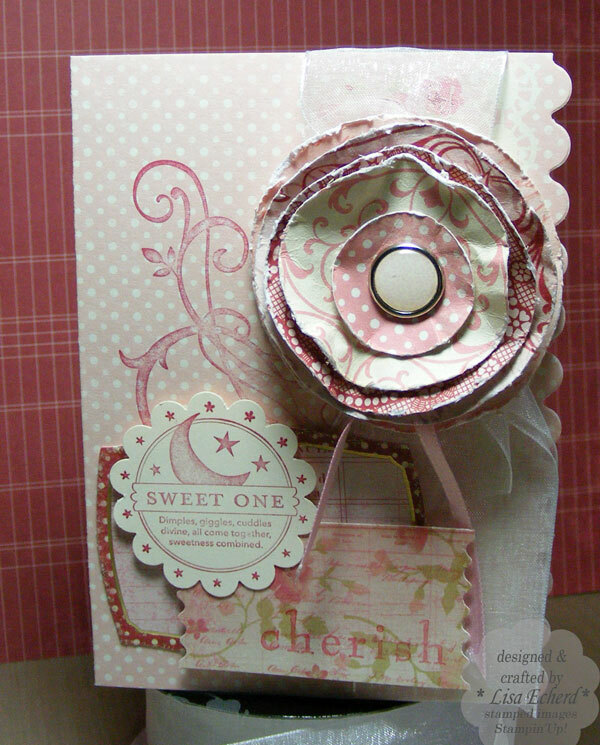 Cardstock: Sweet Blush by PTI! DSP and ink: Soft Suede by SU! When I was doing yesterday's layout, I needed a flower to finish off the embellishments and just didn't have quite the right design to cut on my Cricut. So I stamped an image on designer paper and cut it out by hand. 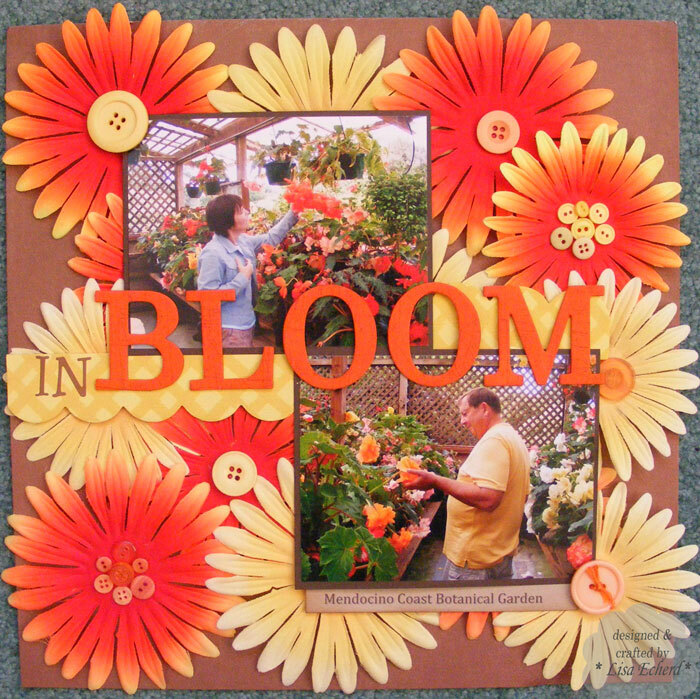 I liked it so much, I did this card with several images. 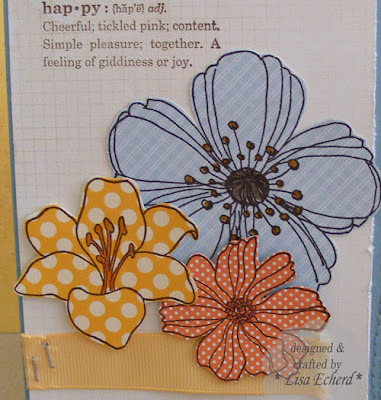 When stamping, I tried different colors with different flowers to see what I liked. To get the look, choose small pattern papers and an outline stamp. 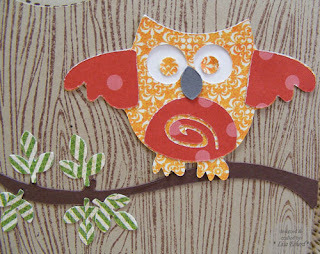 Stamp directly on the pattern paper and cut out. 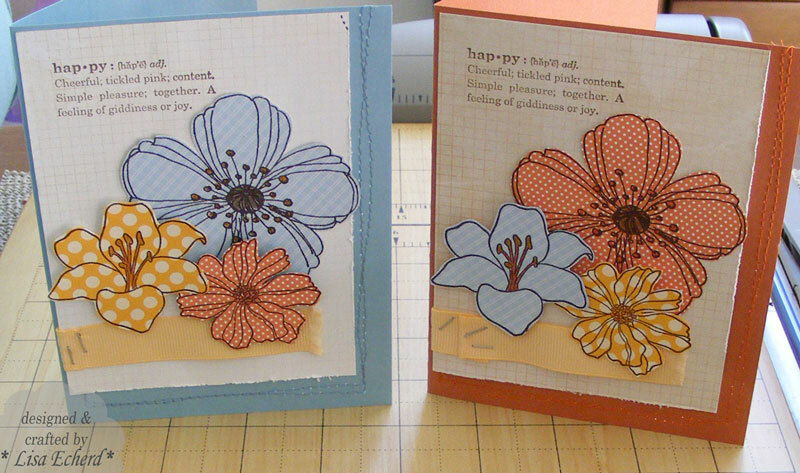 To finish these flowers, I used markers to color in the centers. Normally when I use these stamps, I'm coloring in everything with markers or watercolor crayons. This was much faster and I love the results. Ink: Dark Brown by Colorbox; Soft Suede by SU! This is my card for the baby shower today. 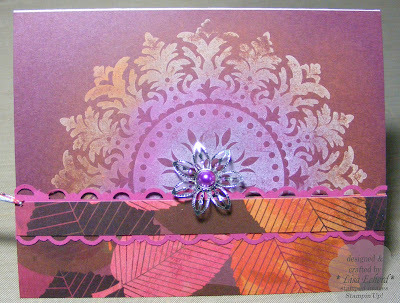 I love using these October Afternoon papers for die cuts. 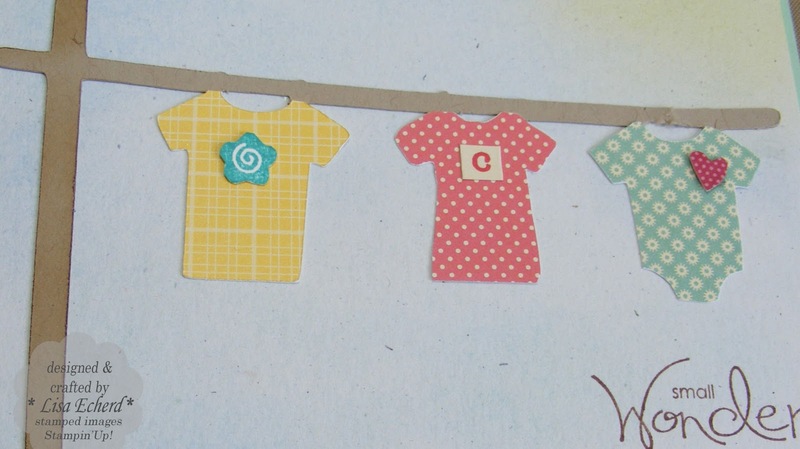 The tiny patterns work so well on these 'baby clothes.' 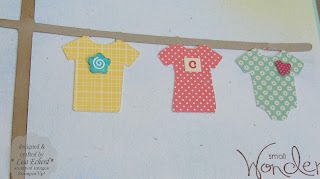 I did find it better to stamp the embellishments separately, cut them out and the glue to the baby clothes rather than try to stamp directly. The little 'c' is a sticker representing the new baby's first name. The flowers in the border have a tiny hole cut in the center presumably for a brad. I just did a touch with a green marker in the center of the yellow flowers to keep this simple. The background of the card is a piece of naturals white cardstock rubbed with pastels. Naturals cardstock has quite a bit of texture to really picks up the pastels. So my card is more in the 'clean and simple' category than my Mother's vintage inspired card. I enjoyed doing a bit of both to welcome a new baby girl. Ingredients: Stamp: Whimsical Words by Stampin' Up! 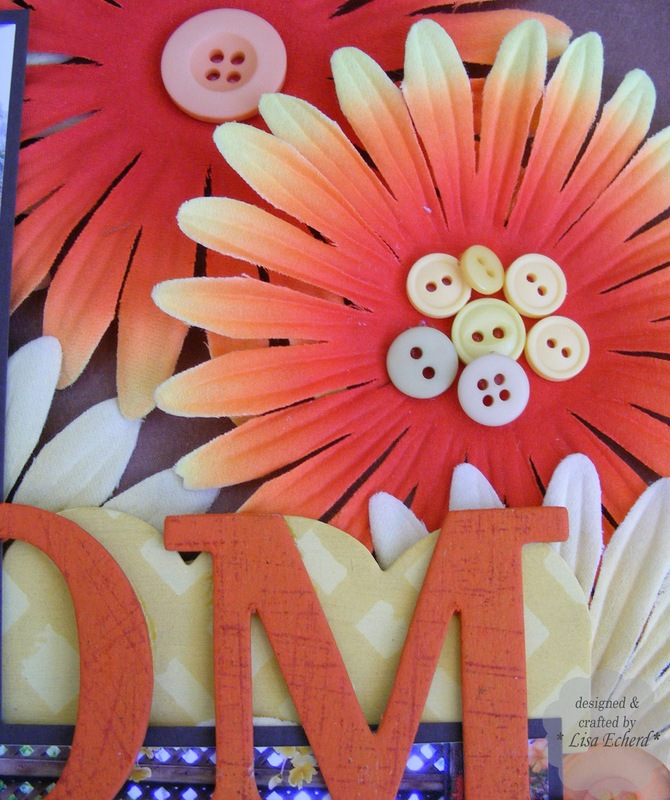 If I am making a card specifically for someone, I usually try to make the card to recipient's taste. I choose colors and a style I think suits them. Do you do this? Is this normal? I figured it was just habit from my work designing window treatments and helping others select colors and furnishings for their homes. This weekend, my mother and I are invited to the same baby shower. We know the grandmother-to-be very well but don't know the mother-to-be that well. So I decided to make cards more the style of the giver. This is the one my mother will bring. Mother is the kind of person most of us envy. She can throw together a half dozen items of clothing and jewelry none of which were bought at the same time and the same place or seem to the same style and make them work beautifully. So for her, I did a more vintage style card with lots of layers. Since this is a tough style for me, I stuck to a monochromatic color scheme. The papers and die cuts are from one line of products. I added some stamping and different techniques to give it that 'artsy' look. The flower technique is from the October Afternoon blog. I found this via Sue's Friday Picks linked here. I left off the glitter. Thanks, Sue. It really is an easy flower to make. Tomorrow, I'll post my card. It is certainly a different style! 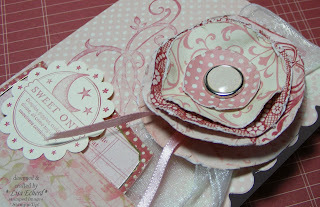 Ingredients: Stamps: Baroque Motifs and So Many Scallops by Stampin' Up! Using the Split Coast stamper's sketch challenge for this week, I finished off the Offbeat collection from Basic Grey. I sometimes get stuck using the same stamps with certain types of paper. It's like some designer papers just calls out for a certain stamp. This paper really went well with the Cheap Talk stamp set. Rather than stamp and cut out the stem from the stamp set I cut the stem using the Cricut which is always more precise than I am. To keep some of these light colored pattern papers from blending together I put everything on white mats. For white card stock I often use a ream of white card stock I purchase at the office supply store. 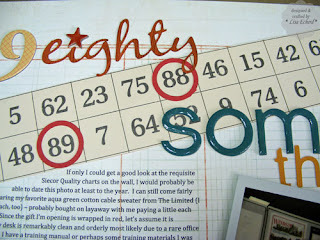 It isn't that great for stamping but wonderful for typed journaling or mats and it is really inexpensive. Ingredients: Stamp set: Cheap Talk by Stampin' up! My 12x12 Sterlite stackable drawers not only help keep me organized (as much as possible for me) but also from getting too out of hand with my purchases (again, as much as possible). When I run out of drawers, I have to stop buying pretty paper. So what to do when I see all these great new paper collections? Well, I have to clear out drawers of course! In clearing out a couple of drawers yesterday, I found some chipboard that was running fairly low and thought I'd use some of it up along with older pattern paper collections. 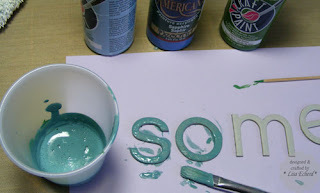 One great way to use up those extra letters whether chipboard or stickers is to make cards. I had so much fun with these. Typically, I really like my chipboard to match at least for a full word but I just used what I had extra and it made these more whimiscal. Using up your stash is so freeing. I find I can really experiment when I'm not saving paper for something later on. 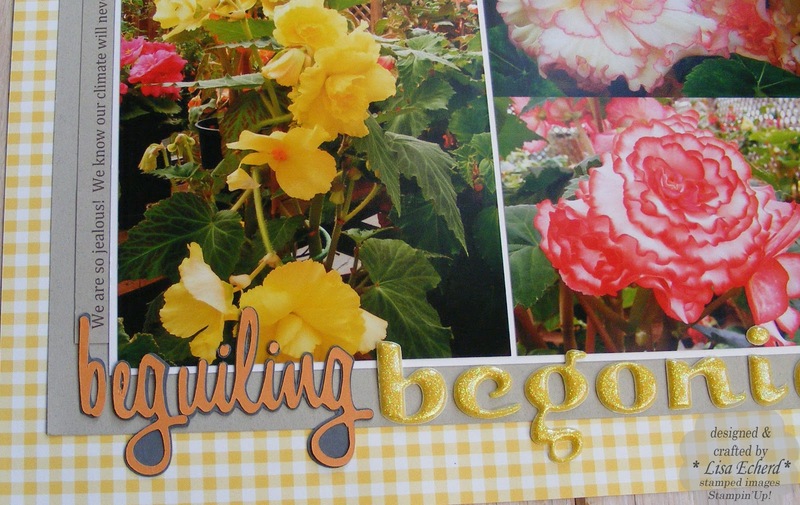 When using leftover chipboard on cards, you may find it a bit like playing Scrabble. You have to form words with the letters you have and you have to pick words that will work on a card. It's just a new kind of challenge. Cardstock: Naturals White and Bashful Blue by Stampin' Up!